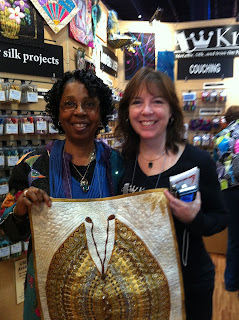 One of the best parts of attending a quilt market or festival is meeting designers, who, in our world, are celebrities. Karen Boutte is one such person — she is a fabulous designer who always carries a smile, hug and great idea. At the last show, she brought us a stunning butterfly quilt, made using our threads for surface embroidery (like ribbon, braid, 3/8" Trim). Read on to get to know Karen and discover her tips for using decorative threads. Q: How did you get started as a quilter? A: I did begin sewing as a child. My mother made all of my clothes and she would let me play with her scraps. I made some doll sized accessories, but not doll clothes. This started when I was about 6 years old and then I was hooked. By Junior High, I was making dresses for myself. I didn't start quilting until much later. It was after a family reunion in 1989 that I got interested in quilts when I saw a Cathedral Window quilt that my Great Aunt Nora made. Another "oh my" moment; I was hooked on quilting. Q: Tell us about the butterfly quilt you made for Kreinik. What was your inspiration? A: Couching Butterfly was inspired by a Robert Kaufman fabric for the "Grandeur" collection. I guess you can call me the "Fabric Whisperer". When I walk into a quilt shop, some fabrics just talk to me. I am always on the lookout for exciting bold prints. To compliment these I search for tone on tones that offer texture and movement. The background for the Butterfly quilt is a Northcott "Stonhendge". I saw the Kaufman fabric and it just said ..."buy me, I am beautiful and you will find a way to make something out of me" so I bought 3 yards (my minimum for a beautiful print since I can make a jacket with that amount of fabric). The fan shapes in the fabric reminded me of butterfly wings, so I just started cutting and arranging. Most of my garments are fabric collage, so the more action in the print, the more holes it will have in the end. Q: How did you use the various Kreinik threads on the quilt? A: Embellishing with the Kreinik threads was the fun part! After cutting out the wings, I stitched them in place using the Kreinik High Speed metallic thread around the edges in Antique Gold. I then began playing with the 1/8" metallic ribbon to cover the edges of the wings. I then took the 3/8" Trim (a wired ribbon), wrapped it around a cuticle stick, slid off the coil, laid it on the butterfly wing and flattened it to look like rick-rack. I sewed this down with a decorative stitch using Kreinik's silver high speed metallic thread. I used the gold wired 3/8" Trim and wrapped it around a flat ribbon and stitched it down with Kreinik's gold high speed metallic thread. The antenna, body and tail of the butterfly are 3/8" wired Trim in Hot Chocolate color. I twisted the top wire, stitched in place and hand stitched beads in the centers. I wrapped the center body thread around a pencil and gently stretched it over the center seam. I added drop crystal beads for accent. The end of the tail in strung through a 1/2" copper bead. I added several rows of hot fix crystals to enhance the print of the fabric and add balance to the wings. I used free motion stitching on the background to tie the piece together. I used an echo stitch near the sides of the wings, followed by what I call my small ballon stitch. Around the antenna I added my "rock" stitch and used my "wondering meander" stitch around the tail. A: We all have an inner Diva that is struggling to get out and play! When I teach my classes, I request that my students leave the "rules" outside the door and just play with their thread and decorative stitches. We buy sewing machines for several thousand dollars and for the most part use only the straight stitch and zig zag and maybe some free motion thrown in. My mission is to show students how exciting the most mundane stitch can look when combined with decorative thread, like Kreinik's Fine Twist, Fashion Twist and Metallic High Speed thread. If you are a little timid about using glitzy thread or decorative stitches, pick one fun stitch (example, a scallop satin stitch), pick a print fabric and some contrasting thread. This could be a 4" square to test. Cut two 4" squares and set one aside. Iron a stabilizer or use batting on the back of one square and stitch a line of scallops across the fabric. Go back to the beginning and stitch another line of scallops, right next to the first or mirror image the first line of stitches. After that, maybe run a straight stitch on the outside of each row of scallops. You have just created a ribbon stitch that no one else will have! Look at this 4" square and compare it to the plane square, I bet you will like the outcome. The worst that can happen is that you don't like the combination. You've only used a 4" square of scrap fabric and a little thread. Toss it out and try another combination or keep it as a reminder of what you don't like. I keep a notebook of my stitch combinations and samples of the ones I like noting the stitch number, length, wide and thread used. It's fun, easy and a good way to play with the wonderful threads and all those lovely stitches on our machine. Q: Is there a rule of thumb, or advice for how to pick fabric prints that will “embellish well” with decorative threads? A: There are no hard and fast rules for fabric that will embellish. If you tend to like a hint of glitz, use thread that blends with your fabric. If you are like me, you go for the highest contrast you can find. I love bling! When a fabric is talking to me, I will look for areas that will "pop" with the addition of decorative stitches and threads. Large prints are a blast to play with. You can outline a motif, cut it out and collage it to a tone-on-tone fabric or pick one element of the design and repeat the stitch whenever it appears. Again, there are no rules. Q: What are your suggestions or tips for using a metallic thread in the needle of your sewing machine? A: When using metallics I always use a new needle suited for metallic thread (Metafile, Metallica Sharp, Jeans Denim, Top Stitch). They need a sharp tip and a deep shaft for smooth sewing. I place my thread on a vertical spool pin so it glides through the tension discs without twisting. I admit, I have to slow down a bit for my normal racing speed, but not that much! Q: Do you have any tips or a top technique for couching thicker threads like Kreinik 3/8” Trim or Kreinik Braids? A: I love to couch threads and fibers. If your machine has a couching foot, this is the time to play with it. If not, use your open toe embroidery foot so you can see where you are going on your piece. I like to couch with a decorative stitch (of course) and not just a zig zag. I'm not saying never use a zig zag because sometimes it is the best stitch for that project. But try some of the other stitches like the feather stitch. It makes a fun pattern and you can see the Kreinik braids peaking through the couched thread. When using a wired thread, I will use a blanket stitch so the I can curve the wired ribbon and only catch a small "bite" when couching it down. Q: We all just returned from the big quilt industry trade show, International Quilt Market in Houston, Texas. Did you see any trends at the show, anything we can look forward to - or dabble in - in coming months? A: There were so many tools out there, I almost didn't have time to see them all. Going to Schoolhouse helped a lot so I could zone in on the vendors that had new items that fit my needs. 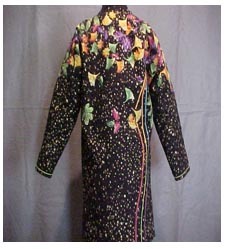 I make quilts and garments using raw edged applique and specialize in embellishing. There were a lot of tools for making dimensional flowers and leaves. I played with an updated tool for making custom buttons and another for adding snaps. Sparkle and bling are still in (Yeah!) with thread, beads, crystals and fiber. I fell in love with several lines of paint and stencils. Now I must use my holiday break to learn to add these new elements to my designs. Just think, you can take a stencil, paint a flower and embellish it with Kreinik metallic thread, creating your own fabric. This would be great for a handbag or tablet cover. That was another hugh item, new bag patterns featuring cell phone, tablet (Nook, IPad,Kindle), laptops and cute little dressy bags. Q: What’s next on your schedule? Or what’s on your sewing table now? A: I am currently working on Jacket patterns for 2012. My book, Delightful Diva Designs, Wonderful Whimsical Wearables has been out for awhile and I though it would be helpful to have instructions for the newer jackets that I have designed. These include a bolero, knee length and mid-calf versions. Q: Where can we find out more about your designs, books, and classes? A: Visit my website www.karenboutte.com for my schedule. I do fall behind every so often, but you can check me out on Facebook or my blog, delightfuldiva.blogspot.com. Side note: after the death of Jerry Kreinik earlier this year, his wife Estelle decided it was time to move out of their historic Victorian-era home into smaller quarters out of state. Estelle, a long-time Parkersburg resident, will be missed by everyone in the community, including the staff at the Kreinik thread factory. My mom came to visit the plant before she moved out of town to her new place. 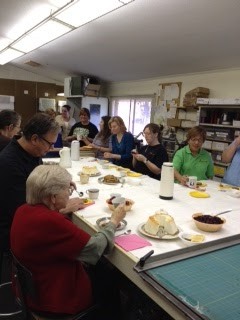 The employees wanted to honor her with an afternoon tea. Work tables were covered with linens, tea pots were brought in, we served an assortment of cakes (angel food, apple and banana) along with fresh fruit, and then added lots of stories and laughter. My mom told about the epic struggle of the first years, and of the hows and the whys of getting into the business. She told them that the banks had no concept about working with small businesses back then, and especially something so strange as the craft and needlework industry. Their first year, they made $75 in total sales. It was dismal in the beginning. She reminisced about making golf club covers with needlepoint faces, needlework backgammon boards and early stitchery kits. Their first trade show was in Cincinnati were they had to fight to be recognized as a resource. Back then, the "manufacturing" was done by hand, and it was a very labor intensive industry: from the manual winders, to applying the gummy labels and handwriting shipping tickets and invoices to all of the bookkeeping. It was a very different business then. We had no computers, no internet, no faxes and no cell phones. The employees wrote down their work times on cards, everyone worked in my parents' house and my mom would watch soap operas at lunchtime. Those were exciting early days for Kreinik Manufacturing Company. People working for us were all parts of families, and they would bring in their kids, cousins and friends. My parents would leave the factory in the hands of the employees for a month at a time and travel to Europe looking for products. They would come back and things would be on task. Our employees have always been very dependable and we could not be where we are today if it hadn't been for that loyalty and good feeling of working together. We will miss mom's smiling face here at the plant, but her traditions of business, family, and friendship will always be a part of Kreinik. Quilt Market report: Absolutely fabulous! This year's Quilt Market (trade show for the quilt/sewing industry) went by quickly. We set up the booth, sold at Sample Spree, then spent the next three days so busy that we never got to walk the show. Dena and I did get to see the quilt exhibit one evening. For a thread maker, it is so exciting to see your threads used in designs. We saw many things stitched with Kreinik threads; there was even a piece with the rings of Saturn where the Kreinik Iron-On Ribbon was used. Side note: I had given a talk a few weeks ago to the judges from the National Quilt Association, and they were amazed with what could be done with the iron-on thread on fabric. In fact, one of the judges related a story where she had judged a piece and could not figure out how the metallic ribbon had been stitched on to the fabric. Now she knows: the "magic" of iron-on thread. I always like to look at the dolls at the quilt exhibit, and this year's selections were outstanding. Kreinik again sponsored the Gypsy Doll exhibit. Those designers are so creative, their little critters really are life-like and fun to view. Our demo teacher for this event was the inimitable Louis Carney - a showman extraordinaire, highly technically skilled and knowledgeable. The ladies love him, he is funny, truthful, and he will not accept whining. He assisted us in giving our class on Creative Trims. It was very successful, the participants did not want to leave and our class ran over by half an hour. We covered cording, creating trim from bits, creating tassels, playing with the iron-on threads for trimming, and just having a lot of fun. We recorded several segments from class to post on our YouTube channel so all can share in some of the ideas. Louis created some unbelievable effects with the Kreinik Micro Ice Chenille, the Kreinik high-speed sewing threads and Kreinik braids. We will post two of his project ideas on our web site in December. I learned many new tips from him. He pointed out, for instance, that on the Baby Loc serger, you can use almost all of our braids, chenille and trims because of the jet threading system. Soon we will start posting videos from the show on our YouTube channel, so stay tuned: www.YouTube.com/Kreinikchannel. Many designers stopped by to show us their latest creations, and we met many new people that we hope to work with in the near future. It was the best show that have I attended all year. The shops were enthusiastic, their customers were happy, kit manufacturers that we spoke with were looking forward to producing new products, and this all led to a very upbeat market.